Summarizing the history described in our previous post: the wealth (I mean the wealthiest people with personal content prone to changes) always has the only goal - to grow in absolute and relative terms, and the wealth has all power and means to do so. The rate of wealth growth is based on the control of (contemporary) most productive population group/technology. The set of control mechanisms evolve in time and adjusts to the ultimate goal. Currently, the most developed countries squeeze the excess profit from extra rapid and global spreading of software governing almost all aspects of goods/services production (e.g. chips, finances) and human life - from basic physical health to deep mental illness. In the modern system, larger and larger groups of population become obsolete as diminishing the rate of profit. These poor people are subjects of obstruction (remember the term "deplorable") since they opposing the wealth growth by populistic/democratic procedures. For example, Trump was elected using such democratic procedures as the person expressing the previous paradigm of wealth growth (as well as people (e.g. the middle class of the 1950s -1990s) and techniques - industry), which has been progressively losing its power and influence since the start of Internet. Trump is preaching a suboptimal approach to the overall wealth growth, and thus, he is a temporary personage (together with other losers) in the history of global wealth. In that sense, the further wealth growth has democratic procedures as an obstacle - deplorable people have to be washed out. Specific mechanisms are under development - from brainwash through defamation to intimidation. Is the humanitarian society dying? The history of social development can be explained as the use of profit making part of population by wealth. Farmers produced a larger part of wealth for centuries supporting sustainable population growth. “Noble” people had harvested the excess profit of food and primitive technical production before effective industrial-size mechanical tools were invented and workers replaced farmers as the excess profit maker. A few centuries exploitation was hard and the working class produced more and more profit allowing replacement of “noble” by the owners of growing factories – capitalists. To protect property the force of knights was replaced by the “power of law” enforced by bought police and court. (Bought means that their budgets are controlled by the governments where the representatives of wealth prevail.) Mechanisms were relatively simple as demanded high skills including masculine power. Workers were the creators of value but the norm of excess profit was relatively small per working hour and a larger part of population had to be involved in industrial production together with farmers with relatively low but increasing productivity. Education was not a production asset and social life was extremely polarized between a small group of the richest and masses. The next step was related to the increasing electric power behind industrial production, which demanded more educated specialists/engineers covering routine processing and further development. Services also started to develop at an accelerating rate in order to sustain the health and productivity of the population part providing the highest input to the excess profit. Specialists, together with highly skilled workers, formed the middle class. Education become the driver of economic growth and fast wealth growth. The skills of an average worker became less profitable asset. The role of the middle class as social life trend maker was high. This golden age was not long, however, compared to the periods of farmers and workers as the prevailing profit makers. Computers changed everything and ordinary line engineers were declassified to average workers. Computer champions became the excess profit makers. Wealth (0.1 per cent of the population) now days gets the highest portion of GDP (GDI) ever. As a result, the household median (real) income has not been increasing since the late 1990s. The excess profit is and economic profit was privatized by the wealthiest part of population. Engineers and specialists (except the most effective and productive) lost their power in social and economic life. Computer geeks are quite different as humans - less masculine power and more creativity sometimes close to psychic illness. Since these geeks provide an extremely high rate of excess profit as individuals unlike chain (production line) workers and engineers the search of these profit makers includes intensive support of their (sub-) culture sometimes in many cases conflicting with the conservative values of the golden age. The larger part of population is excluded from the interest of the wealth first time since the Greek republics. The clash between the wealth defending the profit makers and the conservative majority slowly recognizing own extinction in the process of economic development is the core conflict of the present. The modern liberals serve as lubricant to detach the majority from the political and social power. Conservative views are not welcome because they suppress unlimited creativity. It needs more money, well compensated by the highest rate of productivity growth provided by the creative minority. I do not know how far this conflict will go in the near future and do not care about the winner. The problem is that the next step is likely related to further shift of the excess profit makers to the most creative people at the border of schizophrenia merged with the AI. This is the way of wealth, not the humanitarian society. This society is dying every minute when the income share of the richest increases. Trying to develop a simple math model for the most recent events in western democracies I took some findings in neurosciences (e.g. psychology of moral) as a set of statistical links between variables. Specifically, there is a book “The Righteous Mind: Why Good People are Divided by Politics and Religion” (2012) written by J. Haidt, which stresses the importance of fairness for both conservative and liberal minds (in sense of moral prejudice). All people have own understanding of fairness, having some core values, however. It was also found that people cooperate much better when unfairness in cooperation is punished. When free-riders pay for the absence of fair behavior for other participants (it is not the absence of fairness for the free riders but rather fair-not-ness for the others). The whole ensemble of current fairness/unfairness judgements in the entire population defines net morality in the society. Majority is always around the net value. However, extreme deviations from this net value can be large and such people are most interested in shifting the equilibrium to their side (e.g., preachers, hippie, priests, criminals, etc.). They all proved to be able to influence individuals and groups shifting moral norms, including the understanding of personal and universal fairness. These are examples of inherent moral influence because such preachers do believe in their versions of fairness. Another category of people trying to change the net value of moral judgements at large and using the outcome of such shifting is politicians. One can look at the map of the most recent elections in Austria or in the USA, or any other western country, and observe the distribution of moral predominance in big cities and the rest. It looks like that the whole territory is covered by the same color. And this is usually not the color of the winning party (except the USA). This is great division between conservative and liberal moral, both are intrinsic to people (at least, it is my interpretation of the Haidt’s book). For us, the most important is that this division is dynamic and subject to influence of propaganda (in Bernays terms). We suggest that such influence and dynamics are not random and can be described by simple mathematical model based on laws stationary evolution of an ensemble under endogenous and exogenous forces. Now, we get back to free riders. One part of population considers another part as free riders on average in terms that they obtain more than deserved in a not fair way. The outcome is simple – the absence of cooperation with the other part and cooperation enhancement within the same moral norms group. The division has been growing with time together with the growth in economic (and likely social) inequality. Trump got it (as well as right-wing politicians in Europe) first and sent to the conservative part of population a message that unfairness will be punished (make the US great again!) This is direct message which actually make two major effects – increasing cooperation in both liberal and conservative cores of population and increasing deviations of the average conservative and liberal understanding of fairness from the net value. We develop a math model of moral evolution, which includes the intrinsic (basic) and current distribution of fairness understanding, the dynamic development under endogenous (and likely exogenous in satellite countries of Western Europe) forces depending on the evolution of economic (income) inequality observed during the past 30 to 50 years. The latter is described by the evolution of Gini ratio, the share of labor in GDP (GDI) and the mean personal income. The sensitivity of a person to external influence is also distributed over the population and depends on the intensity of external influence. In other words, increasing economic inequality made many people to feel unfairness and become more sensitive to external propaganda which, in turn, makes people more sensitive on average. Seismic stations in South Korea, China and Russia detected increasing aftershock activity within the mountain where the biggest DPRK nuclear test was conducted on September 3, 2017. A few aftershock events occur three months after the test and about two months after the previous aftershock on October 12. This activity might be related to a complete collapse of the mountain or chimney collapse with opening of a direct access from the explosion cavity filled with radioactive debris to the atmosphere. This is the worst case scenario, but one cannot exclude this effect especially in view of high international tension in this region. China, Russia and South Korea are just in tens of kilometers from the test site, and Japan is not too far away. Seismologists continue detailed study without interruption and delay. We published a book and a few papers [e.g., 1, 2, 3] on economic growth. There are numerous plots demonstrating the decelerating rate of real economic growth in developed countries. The long-term component of real GDP increase is very simple – annual increment in real GDP per capita, rGDPpc, is a constant, which does not change with time since the late 1940s. This makes the rate of growth to be inversely proportional to the current level of rGDPpc: dln(rGDPpc(t)) = A/rGDPpc(t). The population component is large in the USA – approximately 1% per year since the 1950s, but negative in Japan. Therefore, we use rGDPpc instead of rGDP, which is rather misleading. 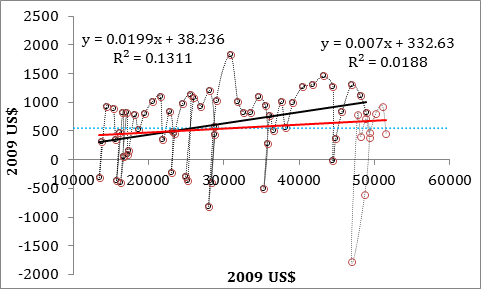 In the first paper published in 2005, we used data between 1950 and 2003 and found that the rGDPpc annual increment has a positive slope. It was considered as an indication of future problems between 2004 and 2016, which was actually observed as the Great Recession and further sluggish recovery. Figure 1 displays the original time series between 1947 and 2003 (black circles) extended by the estimated made since 2004. Instead of time, we use rGDPpc as argument. For recession periods, when the rGDPpc falls, one observes loops in the curve. Our prediction was right – the slope of the regression line has dropped from 0.02 (black linear trend line) to 0.007 (red trend line). The average increment in rGDPpc was $551 as measured in 2009US$. Figure 1. 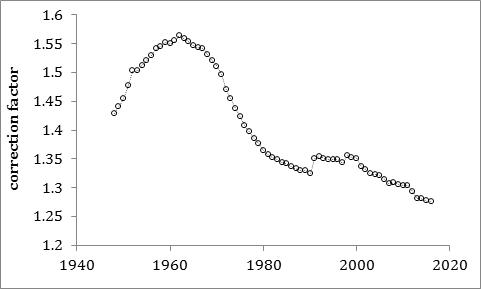 Annual increment in real GDP per capita in the USA since 1947. Black circles show the period between 1947 and 2003, and red circles show the period extended into 2016. 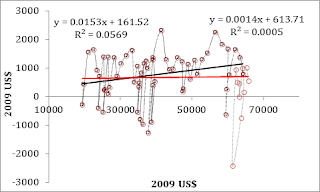 Linear trends are shown in black and red, respectively. 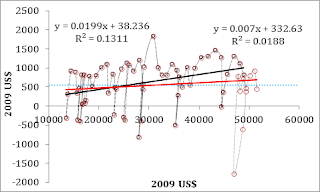 Two regression equations demonstrate the change in slope since 2003. There is another problem with the original rGDPpc time series borrowed from the BEA web site. It is calculated as a ratio of rGDP and total population, while only economically active population matters. Therefore, we have to correct the original rGDPpc for the ratio shown in Figure 2. When the rGDPpc multiplied by the population correction factor, one obtains a better view on the long-term growth rate, as depicted in Figure 3. The trend in the rGDPpc annual increment is absent. This observation means that the rate of real GDP growth in the USA (and other developed countries) is decaying inversely proportional to rGDPpc. Leading economic countries will be growing at a rate of about 1.5% per year in the next 20 years. In 2016, the rate of rGDPpc growth was 0.9% per year. This mediocre growth will be accompanied by decreasing rate of population growth as observed since the earlier 2000s. Figure 2. The ratio of total population and working age population (16 and above). The rGDPpc is corrected (multiplied) by this ratio. Figure 3. Same as in Figure 1, but for the population corrected rGDPpc.